Simon Coveney has said that the backstop has become an “orange versus green” issue. TÁNAISTE AND MINISTER for Foreign Affairs Simon Coveney has said that no one party can hold a veto on proposals for Northern Ireland in Brexit talks. Speaking on RTÉ Radio One’s Marian Finucane Show, Coveney said that the British government has a confidence and supply arrangement with the DUP and that he understands that. “But we don’t have a confidence and supply agreement with any one party in Northern Ireland – we listen to all of them, including the DUP and the UUP and the Alliance, and the SDLP and Sinn Féin,” he said. Coveney said that three out of the four main issues in relation to the Brexit negotiations have been settled: those are the Brexit bill (reported to be around €35-45 billion), EU citizens rights, the transition period and the Irish border issue. He said that the backstop “has turned into a green versus orange issue” and that unionists and nationalists in Northern Ireland fear of the effect Brexit will have. He added that it was important to de-dramatise the situation and talk about the practicalities of trade and movement of goods and people. 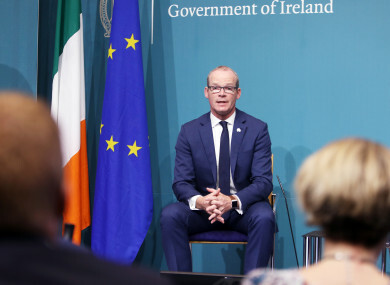 In response to assertions that the backstop wasn’t as “bulletproof” as was first thought, Coveney said that the Irish government wouldn’t sign anything that didn’t guarantee the commitment made by the British government to Northern Ireland. The Taoiseach and I will never sign a Treaty that doesn’t ensure that the commitments that have been given to Ireland by the British government are not followed through on on the Irish border. He said that “it was probably true” the UK “didn’t give a fig” about Northern Ireland in the run up to the EU referendum that was held in June 2016, but that it matters to them now. Simon Coveney said that Barnier has told him that the Brexit Withdrawal deal was 87% completed, but that most of the remaining issues relate to Ireland. He said that he still believed that it was “do-able” to make a deal on the Irish backstop. Tensions over Brexit negotiations have increased dramatically since Theresa May’s speech at 10 Downing Street yesterday, where she asked the EU to respect the integrity of the UK and the Brexit vote. Responding to the criticism by EU leaders of the Chequers plan in Salzburg, Austria over the past few days, Fianna Fáil leader Micheál Martin said during an interview on the Late Late Show that he “didn’t like what happened to Theresa May”. Email “Simon Coveney on the DUP: 'We can't let any one party in Northern Ireland to veto proposals'”. Feedback on “Simon Coveney on the DUP: 'We can't let any one party in Northern Ireland to veto proposals'”.